What is CoffeeCup HTML Editor? CoffeeCup HTML Editor is a website design solution that contains SEO, responsive form themes, email newsletters and campaigns, and layout maker. The app empowers you with handy tag references, intuitive tools like code completion, live previews, website components that update instantly across all pages, and other useful features. HTML Editor offers a smooth workflow for adding structured data. You can click preview and highlight corresponding code. Plus, the app helps to save time as you can add components that update everywhere. For these reasons, it is used by tens of thousands of HTML veterans, developers, and web designers. You can begin in seconds by utilizing a wide range of start options. Create new HTML or CSS files from scratch, or get a jumpstart on a professional design with a ready to use layout or existing theme. If you already have a site in progress, you can open its files from your computer, or open them straight from your web server. With the Open From Web option, you can take any website as a starting point, and it doesn’t have to be yours. Cross-browser compatibility is important, so HTML Editor gives you the option to add up to 10 different browsers and then open them from inside the program. Certain characters have to be formatted as HTML entities in order to render properly. The Characters tab lets you insert these entities with a mouse click. Website Projects help keep your website organized, eliminating broken links and incorrectly referenced images. The built-in Validate HTML tool opens the W3C markup validation service in your default web browser. HTML and CSS code completion virtually eliminates unclosed tags and typos; it even serves up the selectors from every referenced CSS file. 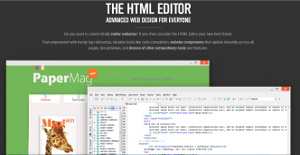 HTML Editor comes with 10 new, professionally designed themes. You can preview them before you apply them to your pages in the Theme Chooser. The Tags tab is a comprehensive reference for (X)HTML, PHP, and CSS tags. Split-Screen Preview lets you view your webpage in a browser right from inside the Code Editor. The comprehensive Tag Reference section puts the correct tags right at your fingertips. Code Completion automatically suggests tags as you type them and smartly suggests selectors from your referenced CSS files. A built-in Validation Tool allows you to check code of all types for perfectly valid pages. Using these tools helps to produce valid code making your pages display consistently, and be more accessible to search engines and disabled users. The built-in FTP uploader effortlessly publishes the website to the place of your choice. Pick any web host (or use your own server), add the corresponding FTP settings, and go live with a single click. Easily switch between addresses; For example, from a work-in-progress to a live production site. Or go FTP-free by syncing with the CoffeeCup hosting platform. Get a custom domain name or use your own. Connecting is easy, you can simply use your CoffeeCup credentials (email and password). If you are considering CoffeeCup HTML Editor it could also be a good idea to investigate other subcategories of Best Website Builder Software collected in our base of B2B software reviews. Organizations have unique wants and requirements and no software application can be ideal in such a situation. It is pointless to try to find an ideal off-the-shelf software app that meets all your business requirements. The wise thing to do would be to customize the system for your specific wants, worker skill levels, finances, and other factors. For these reasons, do not hurry and pay for well-publicized trendy systems. Though these may be widely used, they may not be the ideal fit for your particular needs. Do your groundwork, investigate each short-listed application in detail, read a few CoffeeCup HTML Editor reviews, call the maker for explanations, and finally settle for the application that offers what you need. How Much Does CoffeeCup HTML Editor Cost? CoffeeCup HTML Editor offers a free trial and a single enterprise pricing package that costs $29. We realize that when you make a decision to buy Website Builder Software it’s important not only to see how experts evaluate it in their reviews, but also to find out if the real people and companies that buy it are actually satisfied with the product. That’s why we’ve created our behavior-based Customer Satisfaction Algorithm™ that gathers customer reviews, comments and CoffeeCup HTML Editor reviews across a wide range of social media sites. The data is then presented in an easy to digest form showing how many people had positive and negative experience with CoffeeCup HTML Editor. With that information at hand you should be equipped to make an informed buying decision that you won’t regret. What are CoffeeCup HTML Editor pricing details? What integrations are available for CoffeeCup HTML Editor? You can use HTML Editor’s Applications tool to integrate software with this app. Contact the company for more details. If you need more information about CoffeeCup HTML Editor or you simply have a question let us know what you need and we’ll forward your request directly to the vendor.